And so it begins. I am still new to collecting climate data, so my methods may change over time. Right now, the program I've written takes trends by seasons over an area defined by high and low latitudes and high and low longitudes. On a Mercator projection, this means a rectangle unless the North or South Pole is included. Taken from a pole, a Mercator region will look like a circle or a slice of a pie. I chose not to take all of Greenland because I wanted to exclude Iceland and parts of eastern Canada. 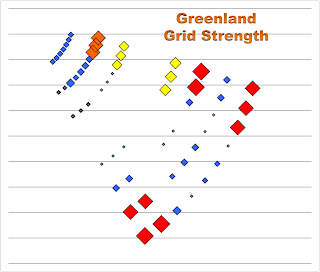 Iceland will be measure on it own in a future post. While the map looks like a rectangle, the slice will actually be a curved shape. The stations have a clump in the mid lower right, which corresponds to the middle south of the map. Right now, I do not show that not all regions report all the years in the range. Future versions of this graphic will show how strong a station is by the number of reports it gives. 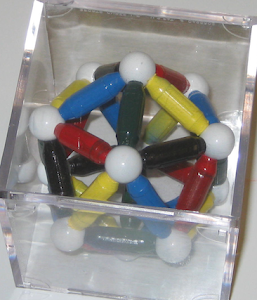 For example, the clump has a lot of stations that were only temporary. The areas that got the most reporting were in the southwest and the southeast, marked on the map in red. The next strongest regions are the orange marks in the northeast. If a region is well covered, it will have 100 diamonds on it. 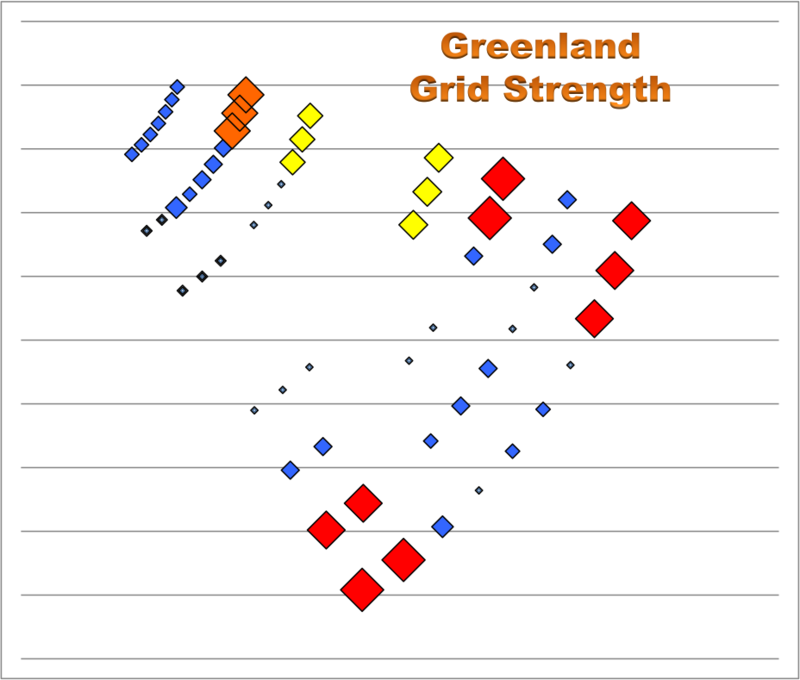 Parts of the middle of Greenland are so remote they have no nearby stations, so those grid points do not even appear. 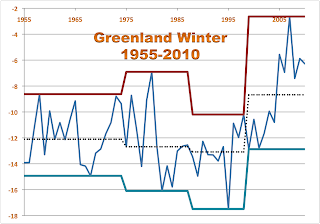 And now the answers to The Two Questions when looking at Greenland Winters. 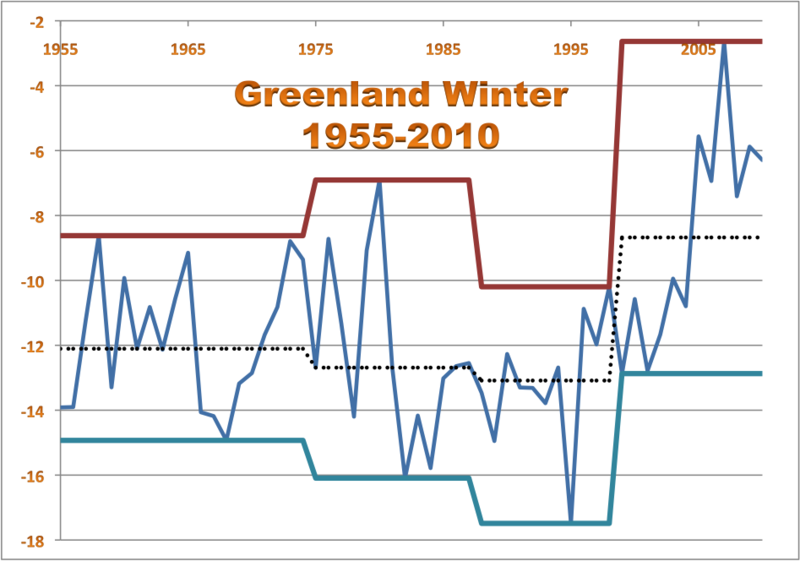 The trend is Greenland Winters are getting warmer, both the warmest and the coolest. 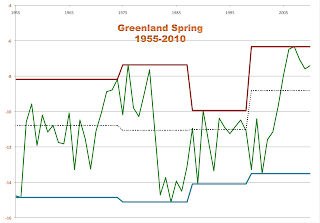 The most recent interval shows that warming trend in Greenland Winters is not slowing down. And now the data for Spring. The trend is Greenland Springs are getting warmer, both the warmest and the coolest, though the rise in the coolest is not as dramatic. 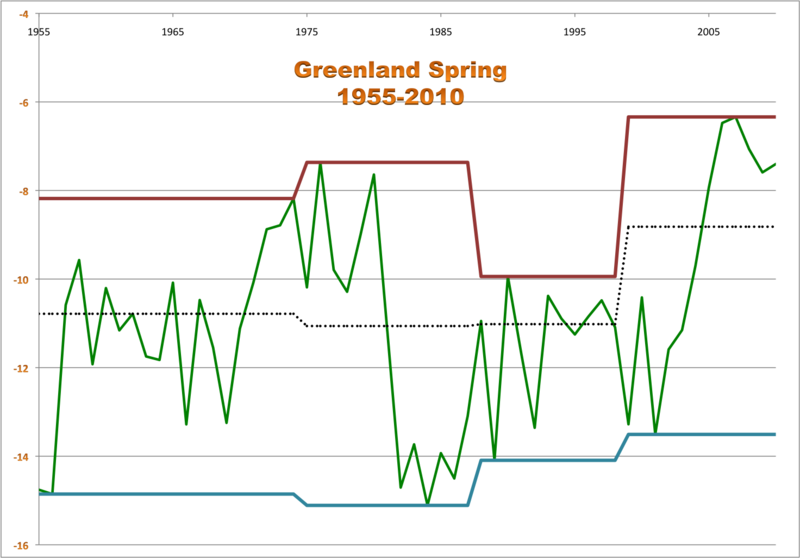 The most recent interval shows that warming trend in Greenland Springs is not slowing down. And now the data for Summer. 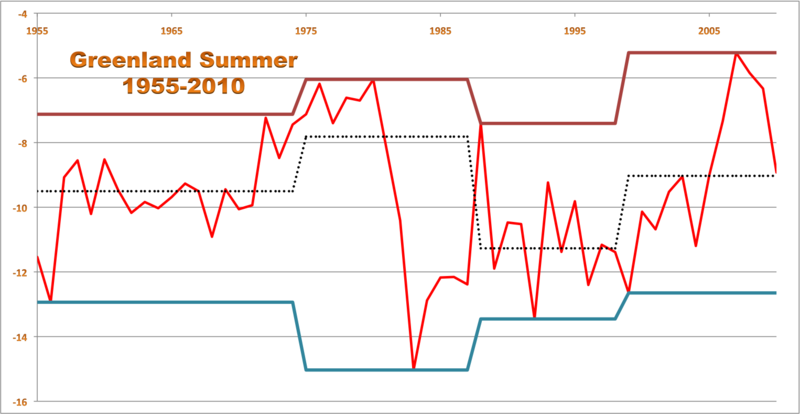 The trend is Greenland Summers are getting warmer, both the warmest and the coolest, though the rise in the warmest is not as dramatic as the Winter increase and the median temperature for 1999-2010 is lower than the median for 1975-1988, the only counterexample in all our measurements for this recent ONI to count as the warmest in more than a half century. 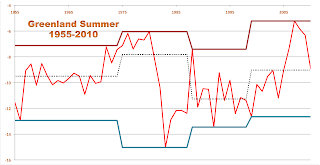 The most recent interval shows that warming trend in Greenland Summers may be alternating. The next Strong La Niña or El Niño year may give us a better idea. And now the data for Fall. 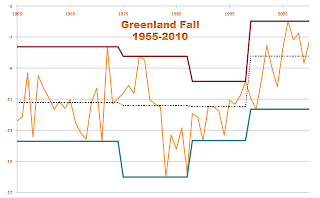 The trend is Greenland Falls was inconclusive in the first three ONI in our time span, but the most recent showed a dramatic increase in highest temperature, median temperature and lowest temperature. 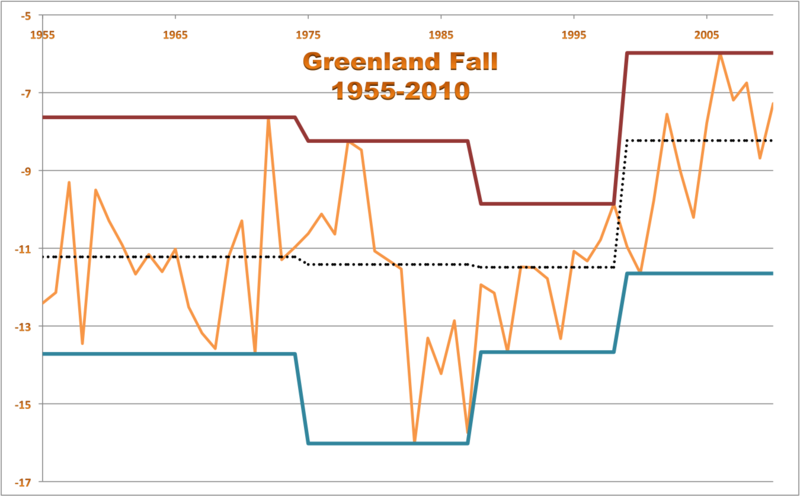 The most recent interval shows that warming trend in Greenland Falls is not slowing down. And this brings me to my first important points about terminology. 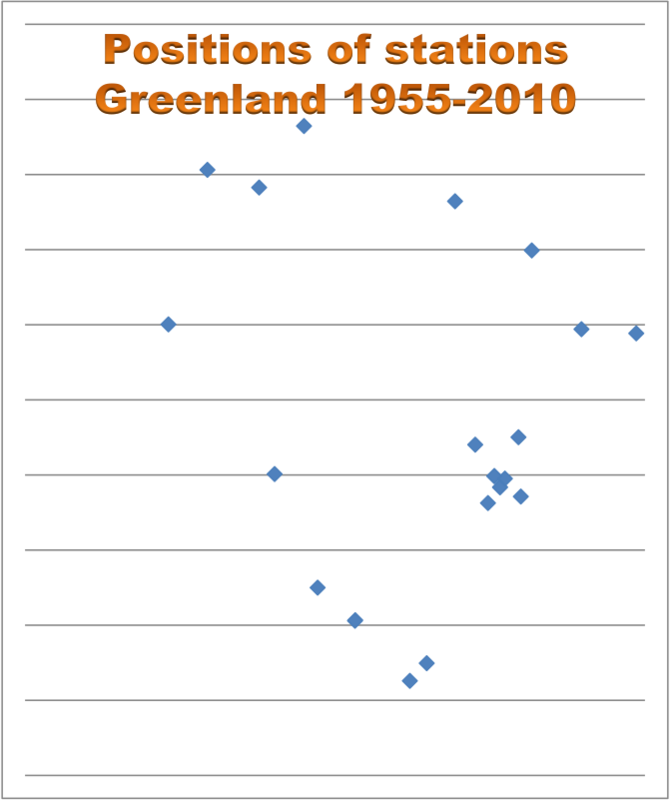 "Global warming" is a bad phrase because not all regions show data as convincing as Greenland. "Climate change" isn't as bad, but it fails to say what the change is. I propose three categories about regions: Warming regions, static regions and cooling regions. 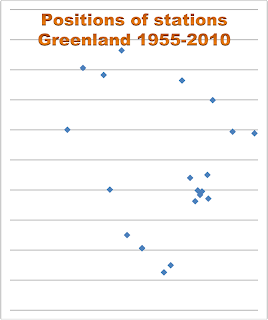 Greenland counts as a warming region.